When it comes to tablets, we’d wager that most Maximum PC readers lean toward the x86 variety—in theory, at least. In the final tally, though, we’re not convinced that this is the ultimate dual-purpose device. Instead it seems like it’s trying to be too much, and falling short in both of its purposes in the process. The Acer Iconia W700 is not a bad product, but it makes more promises than it keeps. It's neither a great tablet, nor a great laptop replacement as its battery life is too short and the supplied accessories too cumbersome. The only genuine bright spot is the screen, but it's not enough on its own to convince us. The Iconia W700 is a hybrid, and hybrids usually come off as either an enlightened merger of technology, or an unsatisfying compromise. Unfortunately, the W700 represents too much of the latter. The tablet itself is workable, and the accoutrements show the germ of a good idea, but the idea of a hybrid PC can (and should) be better realized. The Acer Iconia W700 works best if you plan to take it on the road without its keyboard and are comfortable using it on a desktop with a minimal variety of viewing angles. If you're seeking a Windows 8 tablet that will also serve as a laptop, look elsewhere. The Acer Iconia W700-6465 lies somewhere between slate tablets with mobile operating systems, like the iPad, and Windows 8 convertible ultrabooks, like the Dell XPS 12 or Sony VAIO Duo 11. The W700 is certainly more capable than less Windows RT tablets like the Microsoft Surface with Windows RT or the Asus Vivo Tab RT$579.99 at TigerDirect.com. The W700 is sure to appeal to businesses that already use Windows XP or Windows 7 tablets, like retail, healthcare, and information gathering organizations, but it will also appeal to end users who want a really portable PC that can do more work than the Android-based or iOS-based tablet they've been carting around. It's also an effective laptop replacement for people that retrieve information around the house or on the road. It's a great place to start and a benchmark to compare against, so the Acer Iconia W700-6465 is our first Editors' Choice winner in the category of Windows 8 slate tablets. 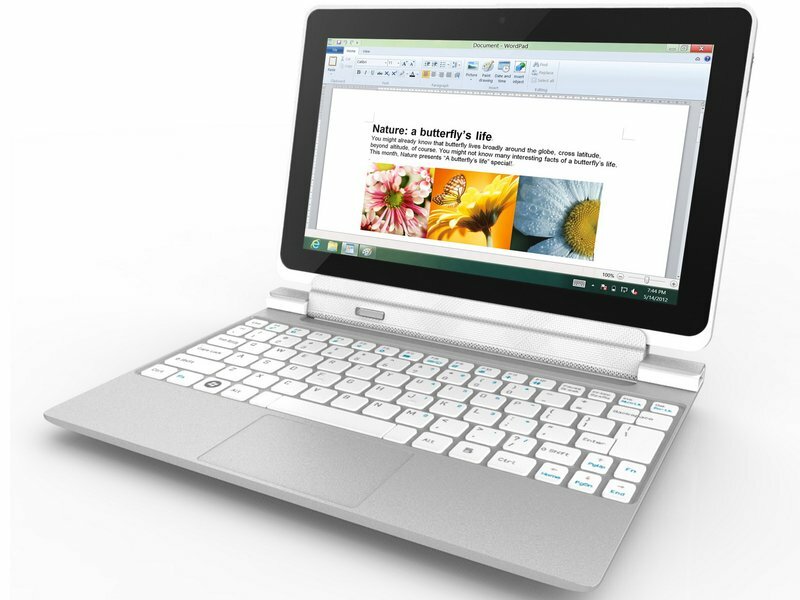 As a powerful Windows 8 tablet, the 11.6-inch Iconia W700 has every ingredient for success. It sports a beautiful, Full HD IPS screen, a stylish and strong unibody aluminium chassis, decent connectivity, and reasonably powerful specs. However, there is no mobile keyboard dock available for it, meaning it will have a hard time replacing your laptop for productivity. Combined with other niggles like the lack of an SD card reader, this would seriously dent the W700’s chances were it not also the cheapest full-fledged Windows 8 tablet we’ve seen, offering truly superb value by including a USB 3.0 dock and Bluetooth keyboard by default. Either way, we’ll be sure to give you our final verdict in the full review coming soon. Windows 8 has been slammed, but not all of the criticisms are fair, nor do they necessarily apply to the tablet side of Microsoft's OS. As the Acer W700 demonstrates, Windows 8 offers a winning tablet experience, and its productivity features show remarkable potential. A tweak here, an iteration there, and the Acer/Microsoft partnership might turn into a perfect Windows 8 marriage.